Yes, I know. It’s been quite a while (a month or two now?) since I changed this blog’s header, and I hadn’t posted about it. I assure you all, I had a perfectly good reason, which was not exactly laziness. I needed to make a couple of tweaks to the design before the official announcement. So even if you have seen the new banner, look again, it’s slightly different! 1) Marion’s first sketch. I wanted something to show the theme of the blog (speculative fiction and romance) but I didn’t have any concrete ideas about a header. She took my vague list of likes (floating islands, Jane Austen, Howl’s Moving Castle, women in space suits) and my request for the blog title to be in there, and what size it had to be, and came up with this. Hello Howl & Sophie, a Jane Austen couple, and space jumper back there! 2) I was worried this didn’t look enough like these characters were from books, so we traded ideas and Marion added some books and pages floating around these figures and added some shading to boot. Of course it took me FOREVER to choose the coloring I liked best. I finally settled on the second one from the top. I felt like this was the right balance in the end – not too pink or yellow or green, just right. 5) Almost done. 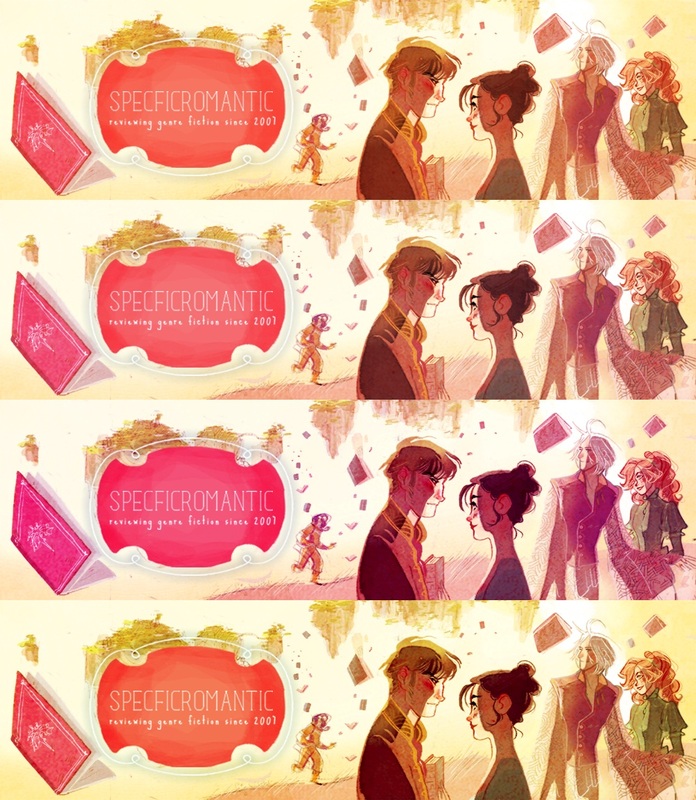 I ask Marion to put a space in the “specficromantic” title. That’s the banner people saw on the blog. She did this for all four colorways because she is awesome, but I’m just showing you the result for the colorway I liked best. 6) The FINAL (phew) banner has a hyphen, and also slightly different colors because in the spaced one above, they got inadvertently muted (it’s a very subtle difference). And that’s it. I’m pleased with the finished product. It makes me sigh in appreciation of… the sheer girliness of the romantic warm colors and couples strolling about. In real life I’m not a very pink girl, but the older I get the more OK I am about embracing things that just make me happy, and this does. This entry was posted in random ephemera and tagged blog header by janicu. Bookmark the permalink. It’s so pretty! I think it’s perfect for your blog’s theme. I recognized the Austen couple right away but I didn’t realize that’s Howl and Sophie until you pointed it out. Thanks! Glad you liked reading about the process. I love the new header. Thanks for sharing the process! It IS so pretty! I am not over it. 🙂 Yes, I was agonizing over the colorways and in the end it really helped to talk it through with my husband. He’s surprisingly decisive over what he likes. I recognized Howl immediately. LOVE the art. It's a dreamy, lovely header. Ah, I’m so glad someone realized it was Howl! And me too. Marion did good. Oh WOW!!! I just LOVE it! Perfect!!!!! Someday I’ll get a cool header. Heck.. any header. lol! 🙂 🙂 🙂 Glad you like it! Gorgeous. I guess you don’t mirror the entries here at LJ? I’ll have to see if there’s a feed or create one. On the one hand I see your point, on the other hand I would then have known to look for a new header on your main blog earlier ^^. Aw. So maybe should have done a brief post pointing at this! I will try to do that from now on.